Trains keep America running. They carry bulk commodities like grain, coal, and petroleum, along with finished products like automobiles, other manufactured items, and imported merchandise. If the trains shut down, America shuts down too. No other form of transportation can carry the vast quantities that trains do – not airplanes, and not trucks. There is no substitute for rail transportation in the United States. The trains have to keep running, regardless of the day, the hour, or the weather. 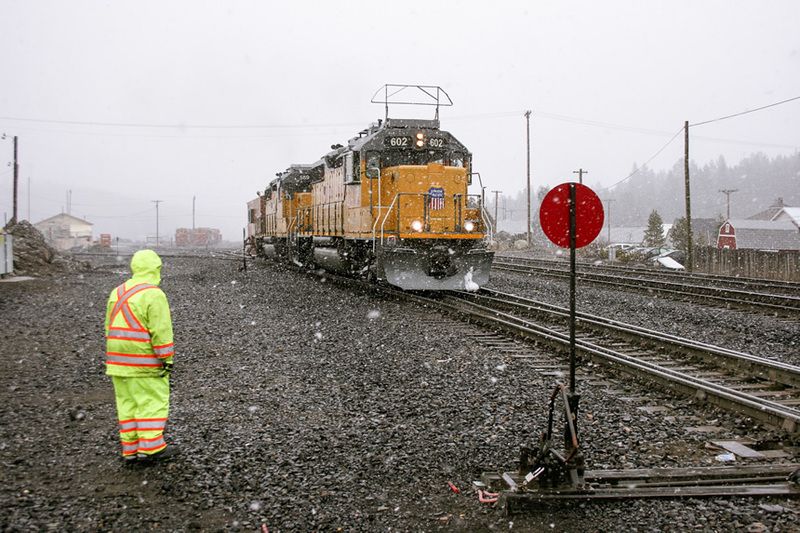 Nevadans are used to seeing trains roll across the state, every day, any time of day, and in any type of weather. It might be easy to take the trains’ regularity for granted, but behind the scenes, there is a dedicated and intensely coordinated effort that keeps the trains running when extreme weather strikes. 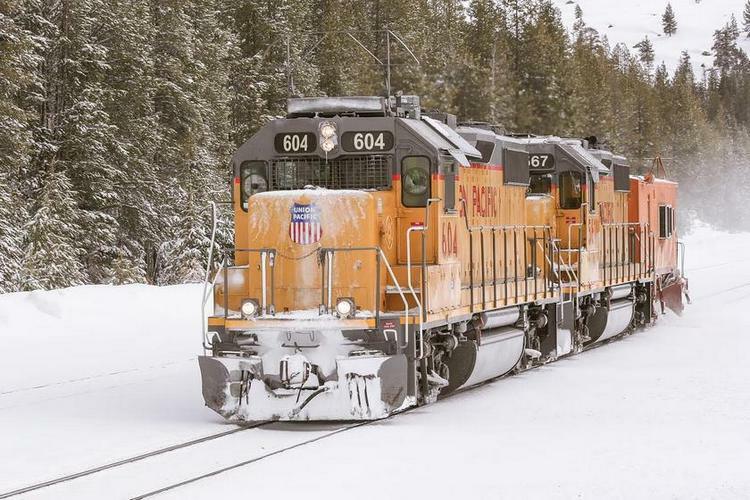 The greatest weather challenge faced by rail crews in Nevada and its neighboring states is severe winter storms which sweep in off the Pacific Ocean laden with with moisture. As the storms cross California, they ride up the western slopes of the Sierra Nevada Mountains. When the storms are forced upward by the mountains, they are cooled by the lower ambient temperatures at the higher altitudes and they begin to release their moisture even more forcefully than they did while crossing the valleys of Central California. During winter, and sometimes into spring, blizzards result in “white out” conditions and snow accumulations up to, and sometimes exceeding, four feet in a 24-hour period. Lighter snow accumulations are handled relatively easily by the railroads. All modern locomotives are equipped with plows on both ends which can push smaller amounts of snow aside with ease. Switches which route trains from one track to another are vulnerable to accumulations of snow and ice which can jam them and prevent them from operating properly. Many switches in snowy locations are equipped with switch heaters which melt away snow and ice and leave the switches free to open and close normally. Propane tanks can often be seen near switches that are equipped with switch heaters. The most crucial switches are protected by snowsheds which shelter them from the ice and snow of winter storms. 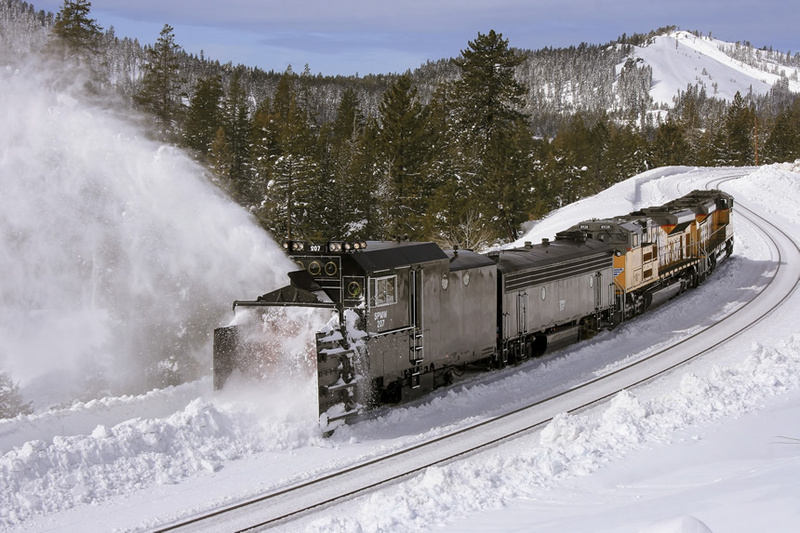 At one time, snowsheds protected more than 28 miles of track in the Sierra Nevada Mountains. Today, most of the snowsheds are gone, but a few remain to protect the most sensitive portions of the rail line through the mountains. Some switches remain exposed to the weather and are not heated. When those switches become buried by snow and ice, maintenance-of-way crews clear away the snow using shovels and brooms. As accumulations of heavy, wet snow increase, the effort to clear the tracks increases accordingly. Specialized railcars called flangers are the first major weapons to be employed as the snow piles up on and around the tracks. 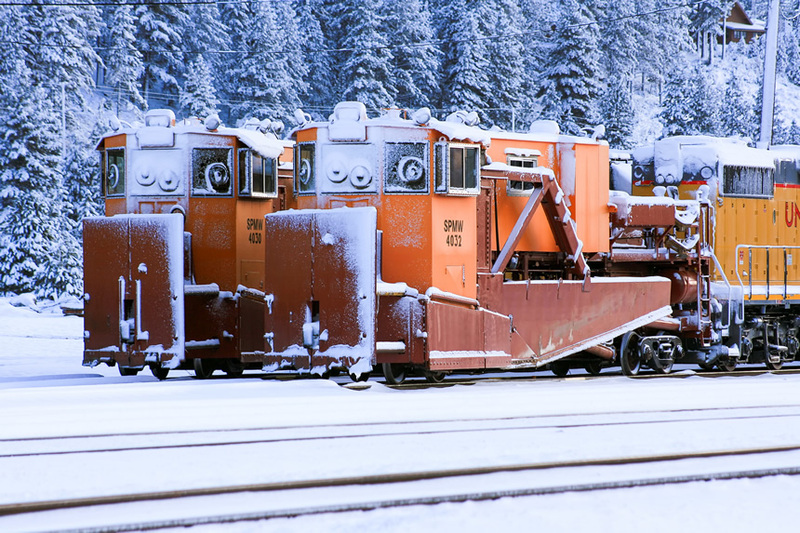 The flangers, which look something like narrow, bay-window cabooses, are pulled by two GP 38-2 locomotives which are specially modified for snow fighting duties. 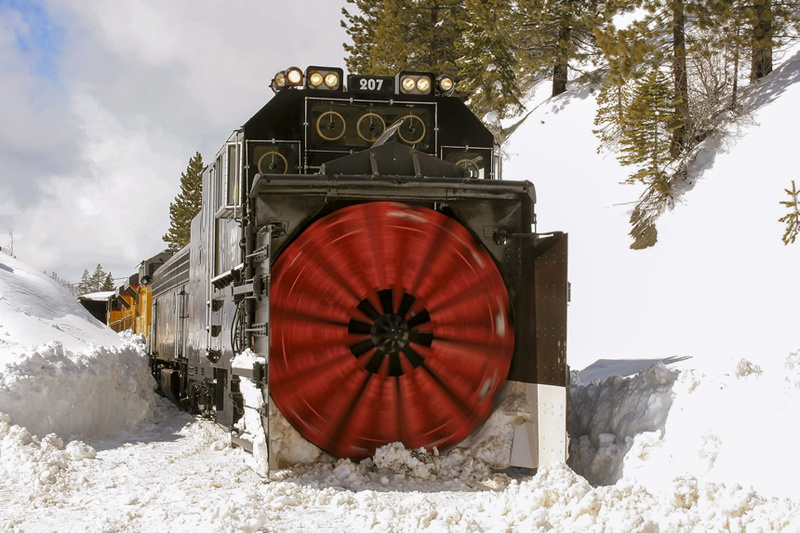 The flangers are fitted with two large plow blades below the body of the car, these blades reach down between the rails to scrape away accumulations of snow and ice and throw them clear of the tracks. 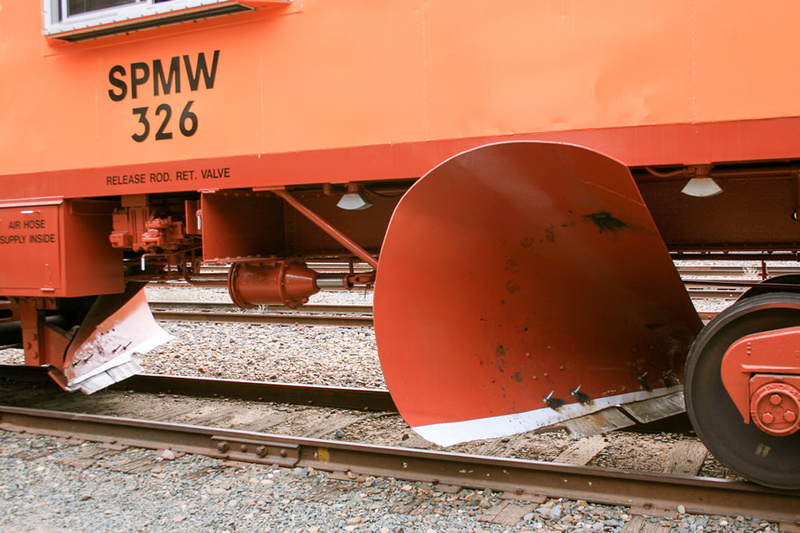 One blade is angled to throw snow and ice to the left of the tracks, the other blade is angled to the right. Typically, snow is thrown away from the other set of tracks, or downhill. The flangers have a concrete floor inside the car body. Several inches thick, the concrete provides additional weight and mass which prevent the car from being lifted from the rails by snow and ice while plowing. 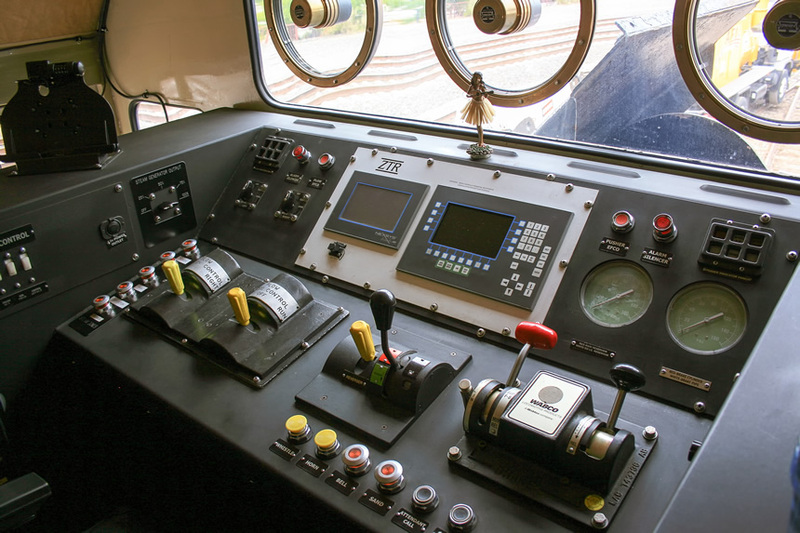 One crewman rides in the flanger to control the blades, selecting a plow to throw snow to the left or right as needed, and raising the plow at road crossings, switches, and some malfunction detectors along the tracks. The flangers cut a relatively narrow path through the snow, just wider than the railcars. As snow accumulation increases, snow must be pushed farther from the tracks to allow room for the flangers to throw following accumulations of snow. 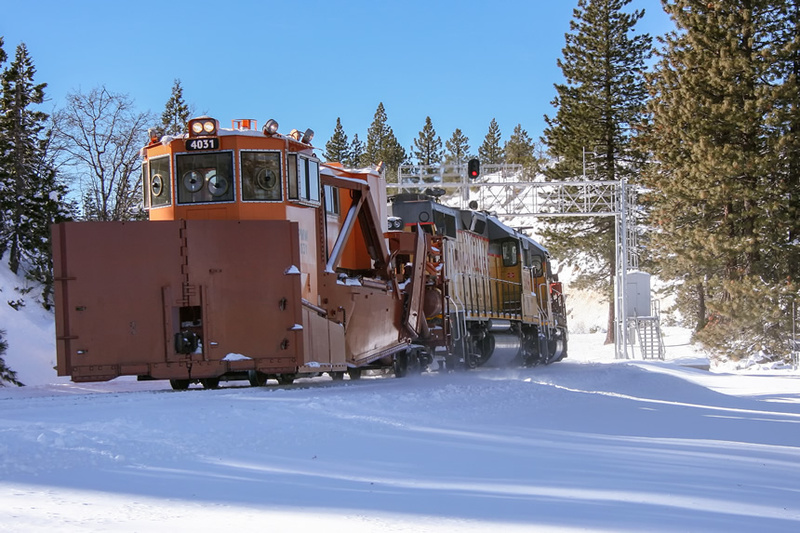 The job of pushing the snow farther from the rails falls to other specialized railcars called spreaders. Originally conceived for the job of spreading ballast gravel along rail lines, spreaders are immensely useful for clearing snow away from near the tracks. Spreaders are usually employed in pairs with one spreader facing each direction and two GP-38-2 locomotives sandwiched in between, so the spreader “consist” can operate in either direction along the tracks. In areas of heaviest snowfall, light bulldozers are brought in to push snow even farther from the tracks, pile it up, or push it over embankments so the spreaders can push the snow out to their maximum reach. 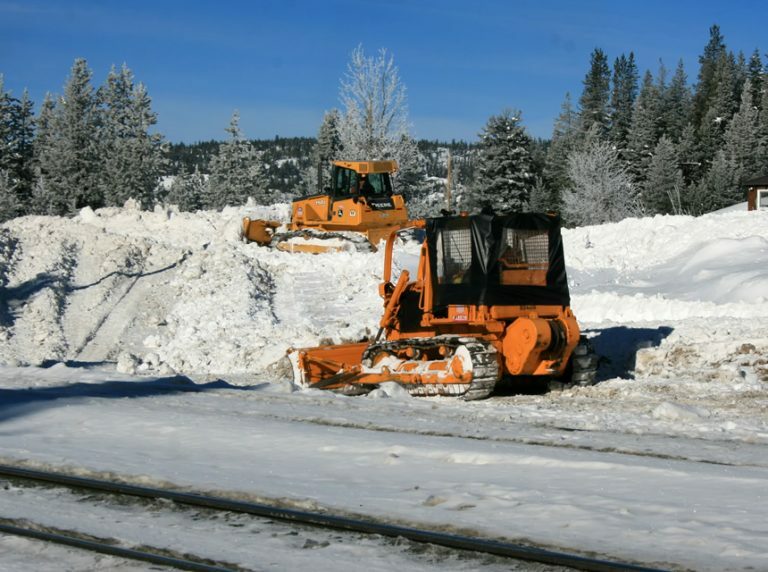 Once or twice in a decade, a major storm will bury the rail lines with massive snow accumulation, far beyond anything the flangers and spreaders can handle. When that happens, the true “war wagons” of the snow fighting effort, the rotary snowplows, are called in. These huge beasts work slowly through deeply drifted snow, throwing it 50 to 100 feet clear of the tracks and reopening them for service. Once the tracks are back in service, the bulldozers are brought in to provide more “elbow room” for the trains and clear way accumulations near the tracks to prepare for the next storm. Now that we have introduced the “Snow Fighters” to you, let’s take a look at them in action.